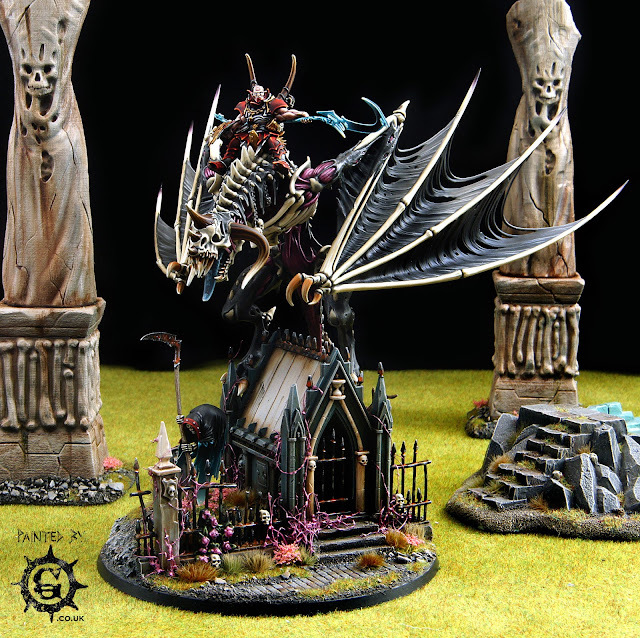 If you haven't read part one of this interview yet, please go to... http://www.hobbyhammer.com/2017/04/miniature-showcase-graham-shirley.html - That post covers the bases of the models, this one covers the dragons themselves. Sean - So this is part 2 of the Zombie Dragon Showcase. I know you have loads of commission work on too but how did you manage to fit both in in what is about a month? Graham - Ha! A lot of late nights basically! I’m also going to quite a few (for me) tournaments this year, the first being our club tournament at Newcastle Warlords on the 17th of last month, so had to get them done for then. Tournament deadlines are a great motivator! Graham - Thanks! 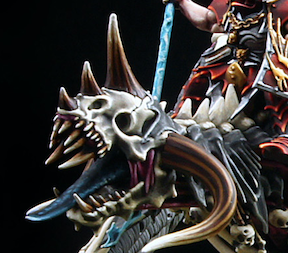 Yeah I’m very happy with them, they make a great centrepiece in what is otherwise just a lot of Skeletons! For bone I use P3 paints, Menoth White Base and Menoth White Highlight. They’re great for it, but not critical, the main thing I think I do differently to most is I use a black wash rather than the more common browns or sepias. I think it gives a great aged appearance, but the fact that it’s just different to the norm makes it stand out the most I think. 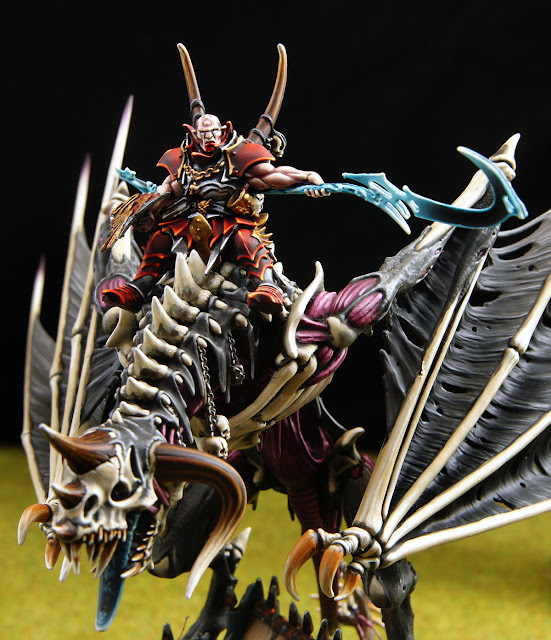 Sean - What made you decide on the colour scheme for them? Graham - Well back during The End Times, there was a period when everyone could summon Skeletons (madness I know) so I bought 10 and painted them up back then. I had half a mind for that to be the start of a new Death army and the Carsteins were an appealing choice, so I painted red details on them. Although I wanted to do the Skeleton Horde back then, playing Death in 8th Edition was not that appealing, so it never materialised. Anyway… Having those 10 done meant I was stuck with the red if I wanted to use them as a starter for this army. 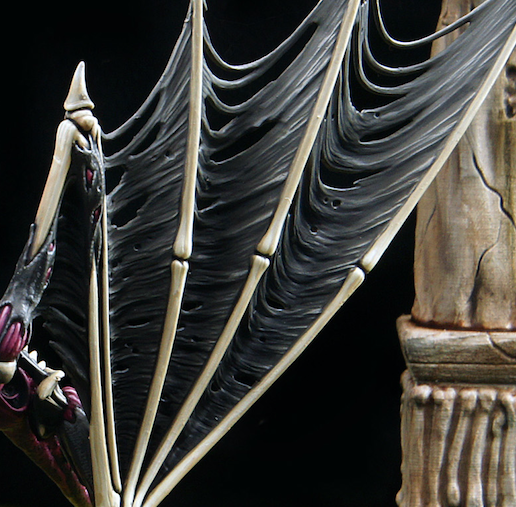 From there I decided on the blue as a spot colour, which could also be used on any spectral bits, magic weapons.. etc..
Sean - The Black really ties the model in, what is your process for Black? Graham - Well there’s a few different types of black here. The main one is just done with working thought the GW blacks and greys: Abaddon Black, Skavenblight Dinge, Stormvermin Fur, Dawnstone, Admin Grey and Pallid Wych Flesh for the final highlight. It’s a lot of stages, but I find having the browns from the Stormvermin Fur and the slight pink hues from the Wych Flesh adds a little variation to what would otherwise be very monotone. The Dragons themselves I wanted to be grey, I just used the same procedure but started from the Skavenblight Dinge and a black wash.
Sean - Did you have to do any greenstuff work to get them to fit nicely on the ruins? Graham - Yeah, not a great deal, but it was fiddly! Mostly repositioning the claws (which had to be cut off their rocks), so they looked like they were curled over the stones. One of them was supported by a claw on his front wing, which meant I had to glue the wings on to make sure it all fitted to the base. I mentioned this in Part 1 and that I’d worry about that later.. And boy did I! So the final stages of Green Stuff work was fixing them back on and covering the joins once it was all painted.. and then painting the fixes.. Phew. Worked out ok in the end! The other conversion work worth mentioning was building one of them as a Terrorgiest and then swapping in the Dragons head again, this made sure both dragons were posed differently for each other. I actually prefer this one now as it looks like he leaning down from the ruins blasting out his Pestilential Breath! The last main conversion work was with the Vamps themselves. I swapped out both of their arms for bare ones as I thought it looked cool. Also, I couldn’t decide (having not played with them yet) on whether to give them Lances or Swords, so I gave them both massive Scythes (from the Manfred Kit) as I figured then they could be fielded as either. I also swapped the helmeted head you see in the WIP pics for a bare head at the last minute so it matched his brother. Didn’t seem fair that one got a helmet and the other didn’t, that would just lead to squabbling! 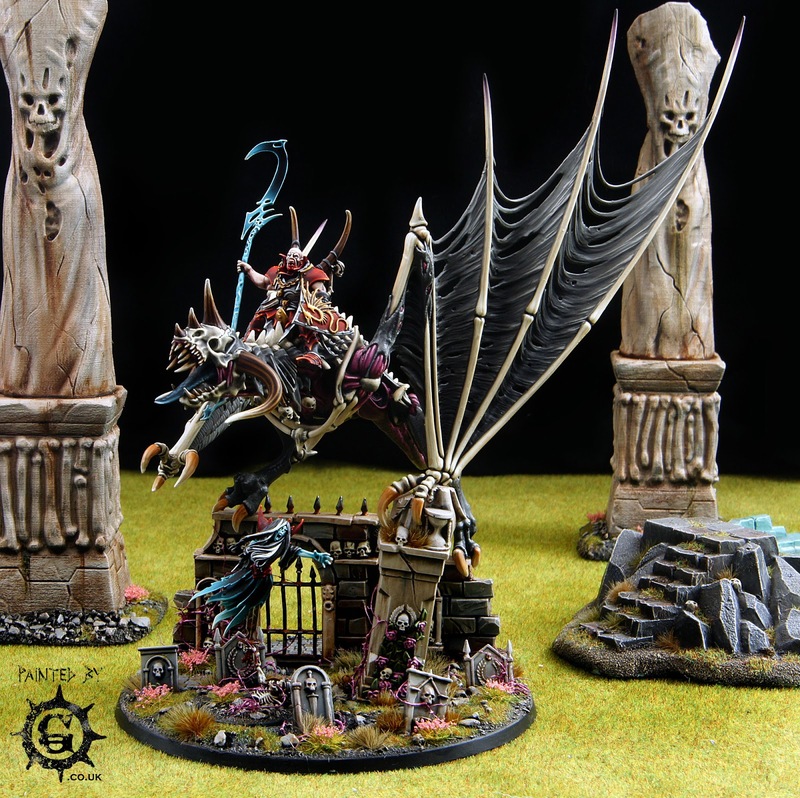 Sean - What is next on your painting table for yourself? Graham - Well since then I’ve completed my Death Army including the kit-bashed Mounted Wight King I mentioned in Part 1 and the Death Realmgate. After that it’s all about making the display board for the army for some of the bigger tournaments later in the year. I’ll probably want to enter Armies on Parade again too, so it’ll have to be fancy to compete for that! 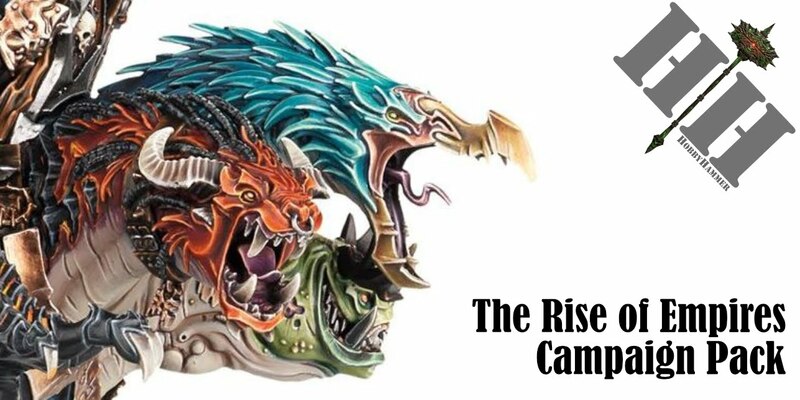 Sean - What you got coming up commission wise, anything 40k based? Graham - Yep! 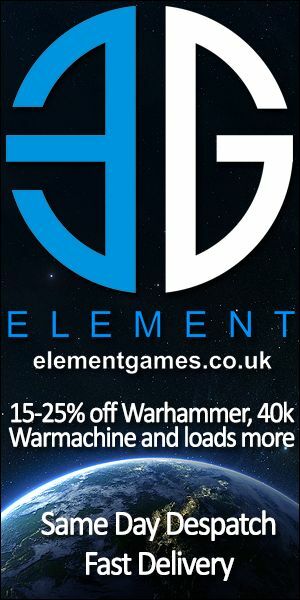 There’s a lot of excitement for new 40k at the moment so quite a few! 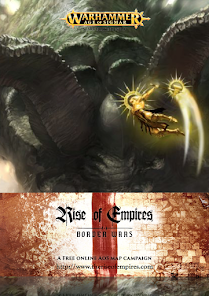 I’m working on some Imperial Guard tanks at the moment and I have a few Deathguard Bloat Drones after that. I’ve also got my first Primaris Marine, a freebie from GW Newcastle (thanks! ), and I’m looking forward to painting that. I’ve put a poll on Twitter to see which Chapter I should do him as, it’s currently neck and neck between Imperial Fist and Black Templar. Sean - Thank you for coming back and talking to me again. Again is there anything else you want to promote or say? Graham - You’re welcome! Thanks for having me back! I’d just like to give another shoutout to our local club, Newcastle Warlords. You can find us on Twitter and FaceBook. We’re meeting every other Thursday at the moment and are always happy to see new faces! Lots of us play AoS but there is also 40k, Necromunda, X-Wing etc.. and I’m running Season 1 of our Blood Bowl league!